Hello everyone! So hopefully you have read Part 1 of our garden make-over story and as promised, here is part 2. I’m hoping that sharing this story with you will inspire and encourage you to do something in your garden, maybe a mini transformation or a full bells and whistles make-over? I would love to hear from you, let me know in the comments! We had just bought the slightly neglected council house that I had been living in for over 20 years and we felt like making a few changes. Budget restraints meant that we couldn’t go ahead and build an extension or anything like that (I wished! ), but I was looking out of the kitchen window into the garden and remembered a pretty picture someone had posted on Twitter the day before. The picture was nothing special, just a photo of a back garden looking like so many other long narrow gardens typical of semi-detached or terraced houses in London. But something had awakened in me. The picture showed a small narrow garden with shrubs and trees planted either side. It was a little overgrown and quite a few large shrubs and trees obscured the back and made it seem as if there was a small jungle at the bottom of this garden. It made you wonder what was beyond. What lay beyond was quite likely a fence, but that wasn’t the point. The point was it looked like there was something to explore, something mysterious, something hidden. The front of the garden, where you would normally have a patio, was gravelled and had a little round table with two matching chairs, surrounded by a few potted plants like rosemary and lavender. Nothing special, but I could imagine the people living there going outside in the morning, with their cup of coffee or tea, sitting at the small table. They would probably listen to the birds singing and they would take in the scent of the lavender, before rushing off to get ready for their daily commute on the tube into central London. It seemed like a little haven, a small sanctuary for people with busy and stressful lives. Nothing special, but still, a little bit of paradise. Could we have a nice garden? I looked at the picture for a while and started imagining how I could make my garden look a little more like this wonderful space. 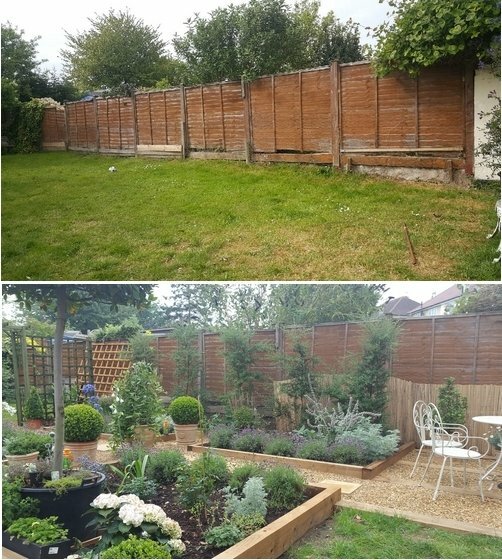 Our garden was quite big for a semi-detached house in a busy town in South London, with nothing but grass (I wouldn’t call it a lawn) and with shrubs and trees planted along one side and the back fence. And in addition it was very uneven. It sloped up from left to right and had several areas that were like mounds where there had been fox earths in the past and where the last tenants had buried all sorts of manner of household rubbish years ago. We discovered this when we started digging to make the beds. Could I make at least a little corner of it attractive enough to want to sit out there? I showed my husband the twitter picture of that little garden I so wished I had. And I mentioned that maybe we should plant something along our fence. And I still don’t really know what happened, but before we knew it, my lovely husband was making a plan. 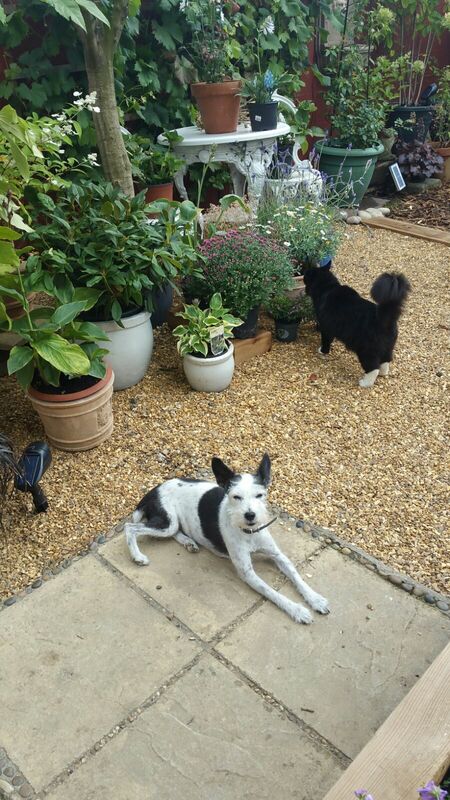 At the weekend, we looked up nearby garden centres and off we went. Little did we know at the time that this was the beginning of our new hobby (or obsession!). We found three garden centres not too far from us that we grew to love for different reasons, and we also went to lots of boot fairs where we bought quite a few plants for much reduced prices compared to the garden centres. My husband bought a rotavator and this is when I knew things were starting to get serious. Anyway, this is how it all started, with an idea. The hard work that followed will be something I will be talking about in this blog. I’m hoping it will be useful or inspiring to anybody who wants to make some changes in their garden. It was hard work but so much fun too. And the result was worth it. I hope you enjoy reading about our garden transformation and I hope to see you for my next installment on how we got started!